I love this photo. It makes me smile every time. We hope you are having a good weekend, friends. We had another good week at Poets United, with another one coming up. On Monday, in one of my favourite features of all-time, we are sharing poems written to beloved dogs after they crossed the rainbow bridge. Bring your Kleenex and stop by to feel the love! On Wednesday, Susan's prompt at Midweek Motif is: Zero Tolerance, a policy that we wish would be universally applied to such things as racism, hate speech - so many issues. There are bound to be some good responses to that. And did you catch Rosemary's feature on Friday? Scroll back if you haven't seen it. The topic was Beowulf, the classic translated by Seamus Heaney. Interesting to contemplate an epic harking back to times when folks' drawing room entertainment was poetry and music. Let's top up our coffee and dive into the Pantry. It is always my favourite part of Sunday morning. I am away from home, and travelling, so I will keep up as I am able and catch up when I get home. Good morning fellow poets, happy Sunday to all. I love that photo too! So full of joy. I love that photo too, Sherry! Made my day! Happy Sunday to All! 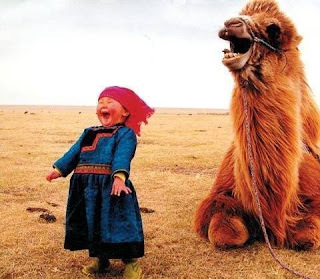 The photo is a reminder that joy is found in the most unexpected places. Happy Sunday, fellow poets! We expect a bit of snow today, through the mountain pass as I head home. But nothing to compare to those in the polar vortex, so I wont complain. Looking forward to reading your poems and i will read more once i am home later today. Happy Sunday and enjoy the cold however you can. A warm Sunday to all. Enjoy! Love the Photo. Put a smile on my face. Thank you. Moving very slow today will try to catch up with the treats in the "Pantry". I've never been able to look at that photo without grinning like a happy fool. Such energy! I adore that photo, Sherry! It made me smile too. It's been sunny here but so cold. I have my fingers crossed for a warmer week. Lovely to see everyone this sunny morning! Hope you all are having a great day, whatever the weather. Hello poets...I'm late to the table, but hopefully not too much so. My aunt has a picture at the same age looking just like this little girl. It always makes me smile. Happy Sunday to you all. It is 57f here. Cold weather returns next week. Hi everyone, I know we are only supposed to submit ONE poem – and I have; it's just that I discovered that by some glitch my name at the first link leads somewhere else entirely. (As no doubt others have by now discovered too.) Try the second one.